In medium bowl, beat oil, vinegar, garlic, mustard, sugar, salt and pepper with whisk until well blended. Reserve 1/2 cup of dressing for salad; set aside. Place chicken in resealable food-storage plastic bag; pour remaining dressing over chicken. Seal bag; turn to coat chicken with marinade. Refrigerate 30 minutes. Heat gas or charcoal grill. In medium bowl, toss tomatoes, cheese, shallot and 2 tablespoons of the reserved dressing; set aside. Remove chicken from marinade; discard marinade. Carefully brush oil on grill rack. Place chicken on grill over medium heat. Cover grill; cook 12 to 15 minutes, turning once, until juice of chicken is clear when center of thickest part is cut (165°F). Let stand 5 minutes; cut into 1/2-inch strips. Divide salad greens among 4 plates. Top with tomato mixture and chicken; drizzle with remaining dressing. 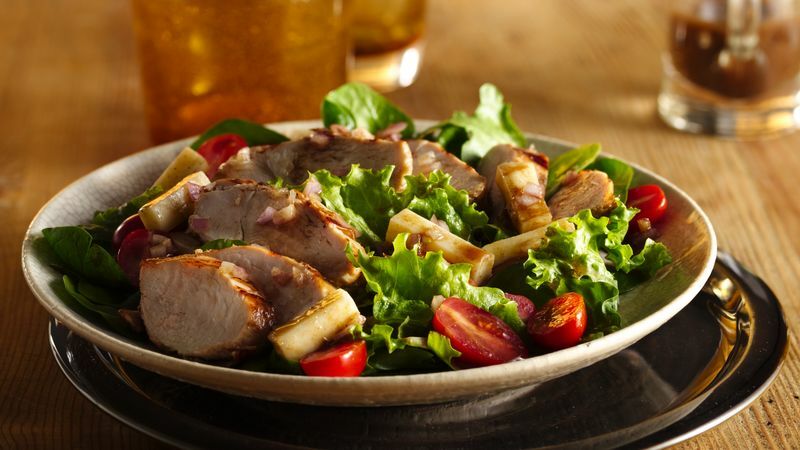 For a heartier meal, serve chicken and tomato salad over cooked pasta instead of salad greens. Substitute balls or cubes of fresh mozzarella to add a special touch to this main-dish salad.